Fully updated throughout, this wickedly inventive guide is packed with a wide variety of stealthy sleuthing contraptions you can build yourself. 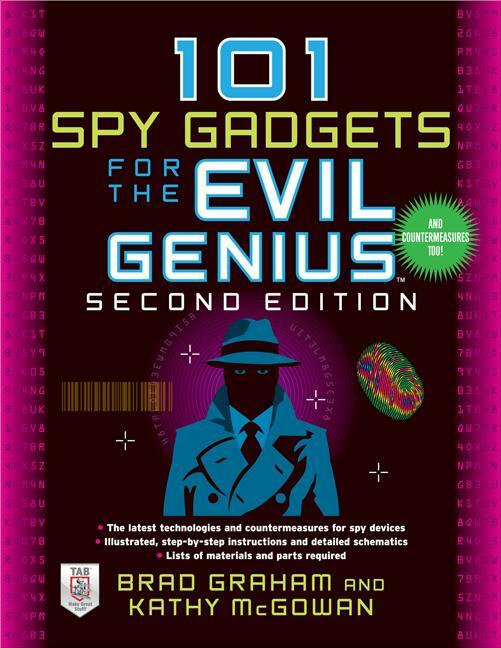 101 Spy Gadgets for the Evil Genius, Second Edition also shows you how to reclaim your privacy by targeting the very mechanisms that invade your space. Find out how to disable several spy devices by hacking easily available appliances into cool tools of your own, and even turn the tables on the snoopers by using gadgetry to collect information on them. Featuring easy-to-find, inexpensive parts, this hands-on guide helps you build your skills in working with electronics components and tools while you create an impressive arsenal of spy gear and countermeasures. The only limit is your imagination! Brad Graham is founder and host of the ATOMICZOMBIE.com website, dedicated to his flamboyant bicycles, robots, and inventions. In 2003, he received a Guinness World Record for building and riding the World’s Tallest Rideable Bicycle. Graham is a network engineer, electronics technician, welder, web developer, robotics developer, computer programmer and inventor. He is co-author of Atomic Zombie's Bicycle Builder's Bonanza, Build Your Own All-Terrain Robot, and 101 Spy Gadgets for the Evil Genius. Kathy McGowan is the co-author of all the titles noted above, and partner in all of Graham's ventures.